Nepal is place rich with cultural background and marvelous natural landscapes that revitalizes and rejuvenates both body and mind of the tourist. With our attractive tour deals and travelling services, Indonepal Kakaji Travels is widely reputed among the clients who come back again and again for the rejuvenating travelling experience in Nepal. Located in Gorakhpur, Uttar Pradesh, we provide our services in Gorakhpur, Pokhra and Kathmandu. 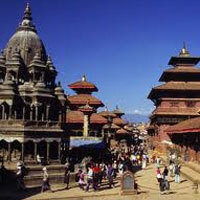 Nepal is also reputed for various monasteries, temples and various other places of significance. Another thing that highly attracts tourists in Nepal is the availability of different types of adventure sports and recreational activity.